So now you know how I recovered from binge eating and how I have helped thousands of others recover as well. This page shows you the different ways that I can offer binge eating therapy as well as therapy for other eating disorders or associated issues such as low self-esteem, body image issues and codependent relationship issues. I offer binge eating therapy for bulimia and associated eating disorders. There are several ways that I work with people. The first and most direct is working with people in my Psychotherapy practice in the San Francisco Bay Area. People come in weekly and see me and we do one-on-one work to help them heal. This is obviously limited to people who live close by. I provide Binge Eating Therapy as well as therapy for Bulimia, Anorexia and associated Eating Disorders. The fee for weekly therapy is $180 per 50 minute session. Click here to make an appointment! Binge Eating therapy in person or in the privacy of your own home. The next way I work with clients is through online consultation and coaching. I can work with you no matter where in the world you are. The fee for coaching/consultation is $175 per week paid in full at the beginning of each month. Click here to make an appointment! *If you are in California, you can get reimbursed by your insurance if you have a PPO or use your FSA/HSA card for binge eating therapy or other sorts of psychotherapy. Binge eating therapy online in California or binge eating coaching worldwide. 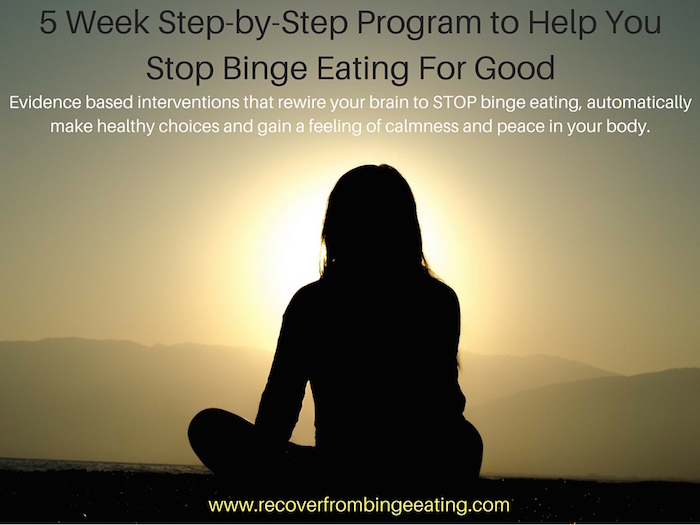 The final way that I help people to heal from Binge Eating is through my online program The 5 Week Step-by-Step Program to help you stop binge eating for good. The majority of people work with me this way as it is the least expensive and you can do it on your own time. It is also a lifetime program, so you can go through it again and again and always be part of the online support group. The fee is $497 for a lifetime membership or 4 payments of $139 a month or 12 monthly payments of $49 per month. The most popular way to work with me is to go through the 5 Week Program. This program is targeted to help you heal from Binge Eating, self-abuse and name calling, self-criticism, self-judgment, and the affliction of thinking too much. It helps you recover on every level– physical, emotional and spiritual. It puts you in touch with a group of other women who are going through the same thing as you are so that you are never at a loss of people to contact, no matter what time it is. There are people from every country and currently from five continents in the program. Everyone is engaged and interested in looking out for each other. Helping you to heal from bingeing as well as undereating/restricting and helps you get back into a pattern of eating that supports your mind and body. Teaching you evidence-based techniques that use neuroplasticity to help change your brain to choose mentally and physically healthy alternatives to binge eating. Teaching you to have a deep meditation practice that can help promote calmness and help you heal. Helping you to learn and practice self-care and self-love. Helping raise your self-esteem and self-confidence levels. Giving you an army of support of others who are doing the program as well, people that you can contact any time of day or night. Access to people who can become your recovery buddies. Giving you extra support during the holidays- one email a day the whole month of December and Facebook Lives weekly during the holiday season as well as implementing a holiday buddy system so that you’ll be safe from Halloween through New Years. Offering several different guided meditations and hypnosis sessions to help you change your brain from one that just responds to its impulses to a mindful brain that can sit and breath through urges and come out the other side. Giving you the peace and calmness around food that you’ve always wanted. Helping you take control of your body instead of having it in the hands of someone else who thinks it knows what your body needs. The only one who knows what your body needs is you, and this program helps you to go deep so that you can actually listen to your body’s needs. Helping you learn to sit with feelings that previously caused you to run to the food. The program teaches you to move through them and transcend by coming out the other side. Utilizing a certain type of meditation that actually changes your brain and actually changes your behaviors. Some people call it hypnotherapy, other people call it movies of the mind. Multiple studies have shown that this kind of meditation is the most effective in helping people permanently change habits and change their brain. This is because when you are able to deeply visualize yourself doing something and feel it, your brain believes you actually experienced it. For example, when you go into a deep meditation and visualize yourself seeing your binge foods and actively making the choice not to binge, your brain actually experiences that as a real. You then strengthen that part of your brain that chooses not to binge when you have the desire to. This strengthens you and helps you to feel more grounded and more solid in order to continue the behaviors that are for your highest good. “I can’t believe that I’m finally free of this obsession. I can finally go out in the world and do things. I have a life now!” Megan R. Montana, USA. Want to read more testimonials from others in the program, just click here! Do you think you ready to start? If so, click here to start for $49 today. There will be 11 more monthly payments and you are paid in full, the program is yours forever to return to again and again no matter how much more content is added. If you’d like to pay in full and never make a payment again click here for the lump sum payment discount. It seems like a lot of work to do in 28 days. What if I can’t finish it by then? The 28 days was based on the premise of a typical 28 day intensive in patient program. You’re not supposed to be “cured” in 28 days, but you get all those tools delivered to you over 28 lessons, and then you have a life time to utilize them and integrate them into your new life of peacefulness and calmness. You can keep relearning the lessons and reinforcing the tools and returning to them. And once you purchase the program, it’s yours for life, so you will have the ability to do it as slowly as you want to, as slowly as you need to take in the information. And you don’t need to do the lessons in 28 days, just do them when you can and practice them. When you are ready to move forward you can do that too. Some people do a lesson a day, but most do one lesson every few days and take a few months to finish the program. Take as long as you need. As long as you are focused on recovery, you can’t go wrong! Is there an annual fee for the program? Nope. It’s yours for life after you purchase it. Is it really possible to recover from binge eating on your own without going to a therapist or getting direct binge eating therapy? Absolutely. Individual therapy is fantastic and I don’t recommend stopping therapy if you are in it, but if you don’t have access to binge eating therapy or an eating disorder therapist or if you don’t have the time or money for weekly therapy, this targeted self-guided program will help you heal. There are alternate ways to heal from binge eating disorder. In fact it has been shown through various studies that self-guided treatment for binge eating has the same level of effectiveness as more traditional treatment models. I am bulimic, would this be a good program for me? It would be a great complement to whatever treatment that you’re currently doing. However, bulimia and anorexia are both life threatening illnesses and because of that, you do need to be under the care of a physician and a therapist specializing in the treatment of eating disorders. This program alone would be an inappropriate level of care, you would need to look for a higher level of care. Some places to find that are recoverywarriors.com and edreferral.com You can also email me directly and I can help you find bulimia therapy or binge eating therapy or in-person treatment. It looks like this program is a lot of work and a lot of information- I really don’t have time to do all this. There is a lot to it, it’s true. I wanted to make sure that it was thorough enough that everyone could find their healing path through it. Even though it’s a 5-week program, it is completely self-guided and it’s yours for life, so you can take as long as you want with it- go through the whole thing in 5 weeks or take 5 months or 5 years to do it- there is no rush. That’s a big part of healing –learning how to slow down. You can either do the whole thing or just find the parts that feel very relevant to you. Many people are finding that they feel relief in their very first day of being in the program. You can take it as slow as you want to and need to and still find lots of healing. Yes. I have a 7-day money refund policy – no questions asked and no shame. You can see how the first 7 days go and if it feels like a bad fit- I will refund your payment. Is 7 days really enough time for me to see if it’s going to work? Yes. You will know if it’s the right fit for you in the first few days. Many people who have started the program in the past few days are already starting to feel relief from binge eating. You can see how you resonate with the program and how it feels to you in the first week. Of course the work is yours to do — and as we all know, everything that is worth doing and results in big changes takes commitment. If you sit and commit yourself to the work- amazing changes will happen for you. For such a thorough program, why is it priced so low? I’ve seen programs like this for over $1,000. As an advocate for recovery from Eating Disorders, my goal has been to help people who have no access to treatment to heal from Binge Eating Disorder. Since 2007, I’ve been giving seminars, webinars, and Internet support for free via the Recovery (binge eating therapy) website. I spent years creating this program and want to make it accessible for those who need it. What are your credentials? How are you able to help me? I have a graduate degree in Psychology plus specialized training in eating disorder treatment facilities as well as mindfulness training. I have been treating people with Binge Eating Disorder since 1999. I am also part of every major Eating Disorder Association world wide and continue to do continuing education seminars to further my skill set and knowledge. Mostly everything in this program is evidence based interventions that are backed by science and research. This is a culmination of years of research, working with clients, studying eating disorders, going to conferences, reading about the newest innovations and interventions and of course working in Eating Disorder treatment centers and with individual clients as well as doctors and dietitians. How much personal support do I get? You get support from both myself and others in the group- and those who have been working the program for a while have a lot of wisdom. I am also on Facebook and within the program I check in to see how people are doing and where support is needed. I will also be on the Facebook group at designated times to answer personal questions. And you can email me separately if your question is too personal to talk about on Facebook. I also do Facebook Live events (recorded too!) so that people can have personal questions answered. Have you actually seen people recover from Binge Eating Disorder? YES! I see it all the time both online and in person. Can I use my FSA/HSA card to pay? If you are in California, it is likely that you can, email me and we can look at your program and see if you can use it to pay. That’s fine and I totally understand, Facebook can be triggering in different ways. You will all be invited to the Facebook group and you can choose whether or not to participate. If you change your mind and want to participate later, you always have that option or you can open a new Facebook account just for the program. If I pay with the flexible pay option, when will I be charged next? You will be charged for the second time one month from your date of purchase. Will you be a part of the online community? Yes, I check in most every day. I answer questions and making sure that people are following the rules. Those rules are kindness, no judgment, no talk of weight, calories or diets. I see that you have Intuitive Eating in there. I don’t think that I can do intuitive eating and I’ve heard it’s not good for binge eaters. The eventual goal is intuitive eating. However, that is not where we start. The beginning of the program is a very gently structured self-created eating plan. We don’t start intuitive eating until the end of the 4th week. What if I’m not ready for Intuitive Eating at the end of the fourth week? It’s structured as a 28 day plan done over 5 weeks. But if you want to take 5 months, or a year or 5 years to go through it — that’s okay. Take all the time you need. When you are ready to get to that part, you can. And what if you’re never ready? That’s okay as well. I have clients who have recovered from binge eating for years and they’re still not comfortable with IE– however they feel good and safe around food and free from binge eating. Again, it’s about learning you and what works for you. That’s the most important part of this program, honoring yourself and your own needs. Yes! Go to recoverfrombingeeating.com for a sample. Do you have additional questions? Reply to this email to ask. Sign up now and you will have access FOREVER! CHOOSE THE BEST PRICING PLAN FOR YOU. You can recover from binge eating and feel joyous and at peace. Although it’s already a rich and thorough program, there will be more added as new research comes out and new people are interviewed. You will have access to exclusive interviews with Eating Disorder, Nutrition and Body Image Specialists. I really can’t wait to meet you and help you through your journey. Could take that much time off from work to get help to recover. I wanted to make treatment accessible to everyone who possibly needed it. So I started working on and creating a program to give everyone almost everything that they could possibly get in intensive treatment without having to be in one place at a certain time and without having to pay thousands of dollars. It took me several years to create the most extensive program that I could for you. This is something that gives you all the tools that you need to find peace within. The tools in this program will give you everything that you need to come to a place of feeling steady, even, peaceful and just normal around food and your body. This is absolutely not a diet, this is a long term emotional wellness program that will help your mind relax and help your body come to its right and perfect body size. That means the size that your body is most healthy at. With love, patience and consistency, your body will settle in to its right place. Are you ready? Sign up now and the program is yours forever! The dieting industry has led millions of women to spend so much time obsessing about calories, carbohydrates, their weight and their body size that they forget who they are. They forget about their gifts and what they were put on this earth to do. I truly believe that if the diet industry didn’t exist that we’d have world peace and a cure for cancer because women would have more time and brain space to do the work that they were meant to do. In this program, you will reclaim yourself, you will come back to yourself and what’s really valuable and important to you. With patience and love, you will stop being trapped in the vicious mind games of hating your body and thinking about food constantly and instead start becoming who you truly are and doing the amazing things that you want and were meant to do. My goal is to make the world a better place by helping women to rise up out of food and calorie and weight obsession and help them to be who they are. I want to help you find the person that you were meant to be, help you to utilize those gifts that you were given and help you to do what you were put on this earth to do. I don’t think that anyone was put here to spend their lives obsessing about their weight. Let’s let go of that and get you the support you need to be the you that the world needs. Recovery is very subtle, it’s not an all at once thing. It takes lots of patience with yourself, but as you integrate the lessons and the tools you begin to notice that you’re doing more things for you, that you’re less anxious, that you’re thinking about food and diets less and thinking about things that feel important to you more often. Each day in the program, you will feel as though you are feeling more and more at peace as you put one foot in front of the other and practice the tools that will bring you peace and help your eating come to a place of normalcy. The daily guided mediations will help you feel confident, loved, at peace and empowered. They will also help you feel calm and bring peace to your heart and to your day and most likely to the people around you. Several women told me that since they’ve been doing the mediations they feel like they are a lot more patient with their kids and not having the urge to yell quite so much. One person told me that her IBS symptoms have gone away. Another woman told me that she never even knew that she had so much peace inside of her. The worksheets and homework will help you dive deeper into yourself to learn more about your behaviors and your motivations so that you stop doing the things that make you feel bad about yourself. You also get the support of the community of others who are in the program. There is support in both a Secret Facebook Group or if you’d prefer to just get support right there within the program, that is an option as well. You can check in every day- multiple times a day with others who are in the exact same position as you- you can talk about how your day was, what your challenges were or any up and coming challenges that you might need support with. Are you still reading? Are you ready to start now? Click here! I quickly want to take a moment to briefly talk about the COST of Binge Eating Disorder: According to the Science of Eating Disorders the average cost for binge food was $30.50 per week- although many people spend much more than that. That comes out to $132 a month and almost $1,600 a year. And over a matter of years that’s a lot of wasted time and money. Not to mention the time that you spent feeling guilty and depressed about the binges. This program will cost you $49 a month for a total of 12 months and it’s yours forever. Or you can choose 4 monthly payments of $139 each or get the discount by paying in full right here. So who is this program NOT for? You are looking for a quick fix weight loss program- this is not about weight loss. It’s about changing your behaviors around food so you can be happy, so you can feel confident in your body, so you can love yourself, so you can feel amazing. It’s not for you if you are in a medically unstable eating disorder such as one where you are purging or dramatically restricting food. If you are vomiting or starving, this is not the appropriate level of care. Please do seek medically guided treatment. Recovery is not all or nothing. It is a life changing effort and it takes time and it takes effort. If you are willing to put some time into this daily, then the payoff will be tremendous. Recovery will sneak up on you. One day you will look back and notice that it’s been months since you’ve binged. You will notice that you feel peaceful and that you feel able to handle what life is handing you. Are you ready to change your life? I’d really like to see you on the other side of this. Click here to start now! I’m really excited to meet you, support you through this and help you get to the other side. Binge Eating Therapy All Rights Reserved. 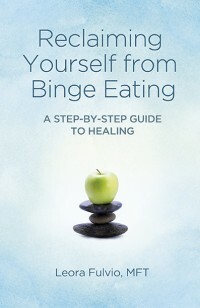 Binge Eating Therapy is part of bingeeatingtherapy.com – RECOVER.